(8 programs on 2 DVDs) On location in Israel and Greece, Myles and Katharine show us the implications of the Acts of the Apostles in history and the future. Bringing Good News from the Middle East, Myles teaches about the birth of the Church on location at the Jerusalem Temple’s Southern Steps. We learn how Evangelist Jacob Damkani, a Persian Jew, fearlessly brings the Gospel to Israelis. At Jerusalem’s Liberty Bell Park, Myles illustrates how the Gospel traveled west, with a positive impact on Europe and the Americas. The United States is a shining example of what the Gospel can produce—and how that is being challenged today. Katharine interviews Rita Tsukahira on Mt. Carmel, where Rita leads a ministry for troubled Israeli Arabs and Jews and for refugees from Africa. On Mars Hill in Athens, Myles teaches about what Paul encountered while bringing the Jewish Gospel to the Greek world. Demonstrating his mastery of cross-cultural missions, Paul drew the nations into the commonwealth of Israel through the cross of Yeshua. Dr. Dan Juster explains the theological connection between Jewish and Greek thought. Corinth, the mercantile center of Paul’s world, presented Paul a unique challenge: to preach of a Holy God in the most unholy environment! Yet, out of the Corinthian letters come timeless instructions on how to live together in a vibrant faith community. Myles interviews father and son Asher and Solomon Intrater on the faith life of the contemporary Messianic community and its reach into the nations. 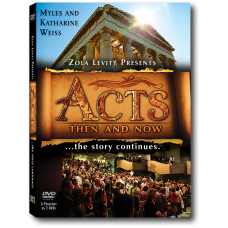 At Ephesus, Myles teaches about the breakthrough lessons in Paul’s letter to the Ephesians. In it, Paul immortalizes the unity of the Spirit between Jews and Greeks (non-Jews) in Messiah. On Mt. Carmel, David and Karen Davis tell the story of Kehilat HaCarmel, their “one new man” ministry in which Jews and Arabs serve God together. Myles teaches in the Garden of Gethsemane, a fitting site to discuss the blood of the sacrificed Lamb. Interviews with Sabra (native Israeli) Daniel Carmel and Arab Christian Pastor Naim Khoury underscore the price paid to follow Jesus in the Land today. In separate interviews, pastors Peter Tsukahira—from Mt. Carmel—and Asher Intrater—of Revive Israel—lead us on a “God’s eye” view of the role Messianic Believers play in these Last Days. Pastor Intrater delivers an important word regarding the responsibility of rising Jewish leadership in Israel.